It illustrates the dovetailing of different avenues of marketing, which is a hallmark of a successful, skillful marketing plan. It should give you new ideas for making your own enterprise more successful on the Web. It demonstrates that with a detailed marketing plan, you do a lot of disciplined creative thinking once (or hire someone like me to do it for you) and then know every month what steps to take to remain on track. Making progress is easier because you know what to do as time moves along without having to continually ponder, "What now?" Create a targeted, practical, just-for-you action plan for the coming year through a program that gets you thinking, strategizing and planning effectively. It includes an emphasis on what works best for you and your target audience. The process is energizing, creative and productive. Learn more about the Marketing Plan Course. As you read on, please remember that this sample marketing plan contains many more Internet-related tasks than other plans might have because the goal of the plan focuses on increasing the success of a web site. I've omitted a few details from this four-month excerpt to preserve a competitive advantage or protect my financial privacy. Note also that the plan does not mention my usual ongoing marketing activities, such as writing and sending out The Marketing Minute every Wednesday and presenting seminars. It lists only the new things I would be doing to reach the stated goals. Although this marketing plan focuses on Internet marketing techniques, I shall maintain as my primary focus organizations and individuals that do business both offline and online and who want to know how to get better results from their marketing. These include solo professionals, professional firms and small to medium-sized businesses in a wide variety of industries. Preferred clients and customers have been in operation for at least five years and have a decent budget for marketing. I have set aside a few thousand dollars for investing in search engine listings, publicity, direct mail and infrastructure. Monies for advertising will come out of increased revenues earned from this plan's marketing activities. One year [just the first four months are presented here]. Have a book release on the horizon? If so, no need to reinvent the most crucial to-do's. Use my sample book marketing plan for a nonfiction book as a model for your book launch - painlessly. Get the sample book marketing plan. Obtain program for easily monitoring Web traffic and study where my traffic has been coming from. Learn as much as I can about getting listed in search engines and writing/designing/coding pages to get pages ranked high in searches. Study which phrases relevant to my products and services are most searched upon. Change pages and create new pages at my site in accordance with what I've learned. Register pages and pay for listings if that's appropriate. Learn how to optimize press releases so they will be found through search engines. Obtain relevant PR contact information from Bacon's at the public library. Use online media directories such as those listed here to compile a fuller list of targets for PR. Distribute at least one press release this month designed to produce more web site traffic and more Marketing Minute subscribers, using the techniques described here. Send Webcards of the Marketing Minute (which I got through GFX Printing) to business editors to encourage them to subscribe. Format course #1 for which rights have reverted so it can be nicely printed as a manual, and begin marketing it. Produce a printed version of one of my audiotapes to sell as a separate product. Convert this month's press release into an article and post at free content sites. Post Internet Marketing article #1 (previously written) at free content sites. Find informational sites on writing, on small business and on marketing and submit pages from my site as suggested links. Post something related to this month's new product in each of my regular discussion haunts. Make sure every article and feature at my site contains appropriate keyword metatags, which help for some search engines' rankings. Revise or remove outdated information. Create and install "e-mail a friend about this page" utility. Ponder changes I could make to convert more visitors to buyers. Continue to monitor the amount of daily traffic, which search engines are sending me visitors and which keyword phrases are bringing people to my site. Find answers for aspects of the search engine process that I don't understand and make changes accordingly. Decide on 6-12 industries to target for the rest of this year and compile PR contact lists for each niche. Distribute at least one press release this month designed to produce more Web site traffic and more Marketing Minute subscribers. Send Webcards of The Marketing Minute to executive directors of professional organizations for selected niche markets. Obtain program for converting material into PDF files. Make arrangements for posting downloadable products for sale. Convert existing special reports into downloadable products and begin selling them. Find licensee for course #2 for which rights have reverted and seal the deal. Persuade appropriate site owners to sell course #1 from their site in exchange for a commission. Convert two more audiotapes into downloadable special reports and begin selling them. Ask Marketing Minute subscribers if they want to place bulk orders for a printed book of past columns, as gifts for their clients. Post Internet Marketing article #2 at free content sites. Add this fall's seminars to free seminar listing sites. Using linkpopularity.com, follow the links for popular sites similar to mine and submit pages from my site to those sites as suggested links. Research the most active discussion boards for sales, marketing, publicity, Internet marketing and other relevant topics and visit the top half dozen or dozen once a week to participate. Subscribe to two new discussion lists and participate regularly on my favorite lists in a way that helps promote my newly released products. Add excerpts or long explanatory copy for products and services that don't yet have that. Check outbound links for accuracy and remove dead links. Change or add to the sample makeovers/upgrades at my site. Register new pages or features in the free search engines and directories. Research appropriate keywords for promoting new products, services or informational pages. Distribute at least one press release this month designed to produce more web site traffic and more Marketing Minute subscribers, customized for each of the target niches. Distribute at least one press release tied to the release of my web marketing makeover book at the end of this month. Brainstorm with web marketing makeover book's publicist on ideas she can help implement. Send Marketing Minute postcards to my old, not-used-in-two-years mailing list. Lay out and prepare for printing the anthology of Marketing Minute columns; send to printer. Create and polish viral marketing tool and post at my Web site. Convert this month's press releases into articles and post at free content sites. Post Internet Marketing article #3 at free content sites. Follow the links for intriguing sites I've recently come across and submit pages from my site to those sites as suggested links. Visit the top half dozen or dozen discussion boards once a week to participate. Subscribe to two new discussion lists and participate regularly on my favorite lists in a way that helps promote my newly released products and services. Complete and launch new web site on related topic. Offer new consulting services related to the new web site. Consider design or technical improvements to boost my site's perceived professionalism. Register newly launched Web site in major search engines. Distribute at least one press release this month promoting my newly launched Web site, customized for appropriate target niches. Distribute at least one press release tied to the release of the second edition of my $500/Year Internet marketing book at the end of this month. Brainstorm with $500/Year Internet marketing book's publicist on ideas she can help implement. Distribute at least one press release this month promoting the viral marketing tool introduced last month. Send Marketing Minute postcards to speakers bureaus. Convert remaining audiotapes into downloadable special reports and begin selling them. Post Internet Marketing article #4 at free content sites. Solicit links for new web site. Update pages at my site to tie into my two books coming out this fall. Update this marketing plan to incorporate new ideas and address unexpected obstacles. If Marketing Minute subscriptions have increased as sharply as planned, investigate moving to a new subscription service that's cost-effective for that many subscribers, select a vendor and implement the move. If revenues have increased as anticipated, investigate online and offline advertising venues for promoting my high-profit products and services. The complete plan includes 8 more months. Despite a stagnant economy, business remained brisk. In 2002, we moved to our dream house and live debt-free among birds, bears and beavers in the hills of Western Massachusetts. The scene at the right is the view from the back of our house. 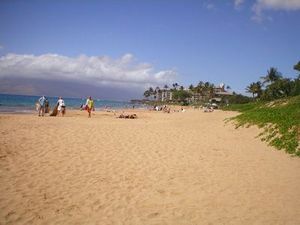 In late 2010, we also purchased a condo on Maui. Building a portable business means we're now able to spend January through May every year at the beach to the left. Now find out more about how you can create a detailed month-by-month marketing plan tailored to your goals and your preferences.